Manage and analyze Windows event logs with full visibility. Resolve issues with Windows Servers before they affect users. Turn massive volumes of Windows event logs into easy dashboards. Turn the burdensome task of event logging into a simple undertaking. Both IT and business professionals are becoming increasingly aware of the importance of analyzing their Windows Server log data. However, doing so can come with enormous operational costs and complexity. The Sumo Logic App for Windows Server offers an easy and affordable solution that centralizes all your Windows Server events across applications, systems, security, custom events and more. More effectively troubleshoot your Windows server farms, finding issues related to server failures and correlating Windows events with IT infrastructure. Sumo Logic’s Windows Log Parser makes it easy to extract granular information embedded inside these Windows events. Keep your Windows Servers effectively utilized but not over-tasked. 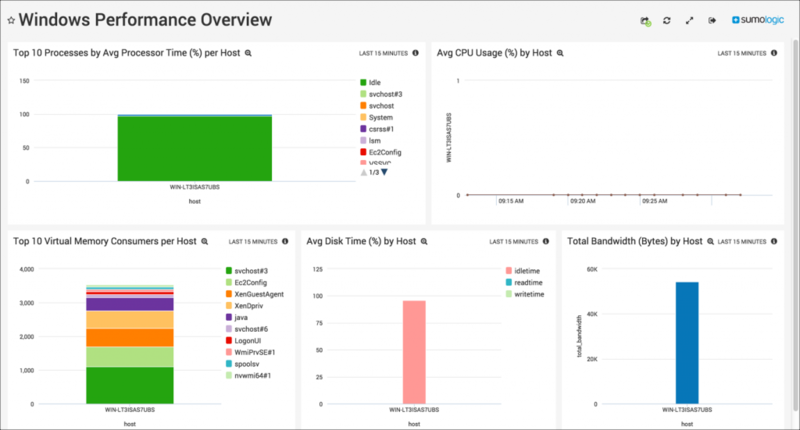 Real-time dashboards help you measure and monitor your Windows server statistics, such as disk, memory and CPU utilization, error counts, running processes, access and other metrics. Operational ease: Sumo Logic can be deployed in as little as 15 minutes, with zero operational overhead. As a cloud-based service, Sumo Logic handles all operational burden, reducing total cost of ownership as well as freeing up customers’ resources to focus on critical business and IT issues. Big data scalability: Sumo Logic’s patented Elastic Log Processing™ is a petabyte-scale indexing and analysis engine designed specifically for Big Data. Sumo Logic delivers superior scalability where on-premise solutions fail. Advanced analytics: Through proprietary LogReduce™ and PushAnalytics™ technologies, Sumo Logic proactively discovers behaviors and patterns hidden in massive amounts of machine data and alerts customers in real-time. Windows Server event logs contain valuable information about your Windows Server infrastructure, including performance, uptime, access, security, processes and more. They are critical for finding root causes of failures, diagnosing system issues, uncovering security incidents and identifying performance bottlenecks. The amount of event logging that takes place in Windows is impressive. Whether a user logs into their computer, or an admin modifies a security group, the event gets logged. With all this activity taking place inside your infrastructure, it's becoming increasingly important to monitor these logs files and analyze key metrics for optimal performance. Many organizations, however, lack the time or the tools to do automated log event tracing for Windows. Sumo Logic makes it extremely easy to monitor your Windows event logs and gain valuable insight from your data. Sumo Logic’s real-time indexing engine processes and manages Windows Server data with near-zero latency, and can help your business reduce critical application and infrastructure downtime by quickly diagnosing and resolving Windows Server issues before they impact your system, network or customers. The first step to getting your Windows data into the system is setting up a collector on a server. Once you've set up a server, all you need to do is configure a Windows Event Source and you're good to go. At this point, all of your Windows event logs from this machine will stream into Sumo Logic in real-time and you can get started with log event tracing for Windows right away. Once your logs are in the system, Sumo Logic provides you with the tools and services to allow you to quickly gain valuable insight from these logs. View the demo of Sumo Logic's LogReduce™ technology and see what the future of log management and analysis has in store.